Pregitzer, K.S. et al., 2002. Fine root architecture of nine North American trees. Ecological Monographs, 72, pp.293–309. Uliassi, D.D. & Ruess, R.W., 2002. 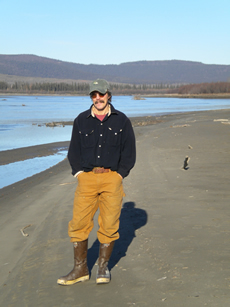 Limitations to symbiotic nitrogen fixation in primary succession on the Tanana River floodplain. Ecology, 83, pp.88–103. Zacheis, A., Ruess, R.W. & Hupp, J.W., 2002. Response of a subarctic salt marsh plant community to foraging by captive lesser snow geese. Ecoscience, 9, pp.320–331. Zacheis, A., Ruess, R.W. & Hupp, J.W., 2002. Nitrogen dynamics in an Alaskan salt marsh following spring use by geese. Oecologia, 130, pp.600–608. Chapin, F.S. & Ruess, R.W., 2001. The roots of the matter. Nature, 411, pp.749–752. Doran, K. et al., 2001. Photosynthetic responses of white spruce saplings (Picea glauca) to controlled density gradients of spruce and green alder (Alnus crispa). Ecoscience, 8, pp.76–88. Mulder, C.P.H. & Ruess, R.W., 2001. Long-term effects of changes in goose grazing intensity on arrowgrass populations: a spatially explicit model. Journal of Ecology, 89, pp.406–417. Zacheis, A., Hupp, J.W. & Ruess, R.W., 2001. Effects of migratory geese on plant communities of an Alaskan salt marsh. Journal of Ecology, 89, pp.57–71. Uliassi, D.D. et al., 2000. Biomass allocation and nitrogenase activity in Alnus tenuifolia: responses to successional soil type and phosphorus availability. Ecoscience, 7, pp.73–79.